The Castle Course, St Andrews is rated 5.0 out of 5 based on 1 verified review from YGT customers. Located on the spectacular cliffs overlooking the town itself, The Castle Course is the seventh course to be created under the St Andrews Links banner, and looks set to be a truly amazing experience. Designer David Maclay Kidd, the emergent Scottish talent of golf course architecture, has crafted a championship layout of incredible beauty. The Castle Course is wedged between the town and the Fairmont St Andrews resort, on the stretch of land that is also home to the astonishing Kingsbarns, providing remarkable views of the ‘Auld Grey Toon’ and St Andrews Bay. More importantly, Kidd’s mammoth creation is a phenomenal tribute to links golf. With five sets of tees, The Castle Course ranges from 5,300 to 7,200 yards, ensuring a stern but appropriate test for every visitor, and while it may need to mature, the layout looks set to become a classic. Into the rugged seaside grasses are carved some monumental holes, not least the 9th and 18th, whose greens share the land of the Kinkell Ness promontory. The eagerly anticipated Castle Course merely strengthens the hand of St Andrews, adding another string to the already impressive bow of the world’s most famous golfing destination. Many view the Castle Course as “The 7th Course a St Andrews” but we actually all found this to be our favourite stop on our tour and would have to recommend it as a must play. 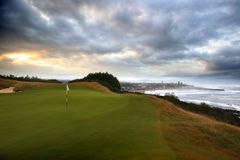 Having heard reports of “Mickey Mouse greens” from a few people, we were admittedly slightly nervous about our round here and while some were are a bit silly at times, the views, overall condition of the course, customer service and general layout make it a very memorable place to play golf. Highlights of our round here included the par 3 17th which is one of the great par 3’s, playing 180 yards over a cliff with a truly stunning view. We couldn’t talk more highly of this course and when I told the group that Kingsbarns is better they wouldn’t believe me!